Higher displacement means less work from the engine to produce torque and horsepower. The new Mercury 150 hp FourStroke is built to develop loads of torque at a stress level that will ensure higher durability than any other 150 hp outboard. Higher displacement simply means more torque and horsepower. The higher the torque, the faster the holeshot and acceleration. And more power equals faster top speeds. The Mercury 150 FourStroke is the only 150 FourStroke to have a torque curve rivaling the strongest two-strokes. Some 3.0L outboards produce well over 250hp. This 3.0L Mercury FourStroke only needs to deliver 150hp, which means exceptional durability and long-term peace of mind. The new 150hp FourStroke also features a robust 4.9" gearcase that uses larger, more durable components. With nearly 10,000 hours of engineering and field testing, we made sure that this 150hp FourStroke is the world's most reliable outboard engine. The lowest weight 150 FourStroke on the planet! What seems like magic is simply Mercury Marine doing what it does best - creating game-changing, incomparable engines that elevate boating to the next level. The new Mercury 150hp FourStroke has almost 15 percent fewer parts than Suzuki's 150 Four-stroke and almost 18 percent fewer parts than Yamaha 150 hp Four-stroke engine. A smaller compact design and a lighter weight reduces the overall package weight of the boat, which, depending on the hull, will improve performance and efficiency. The new Mercury 150hp FourStroke is 454 lbs and is only 22 lbs heavier than the 150 OptiMax (at 432 lbs). This makes the new 150hp FourStroke a great fit not only for new boat packages, but also repower, even on older boats which could not handle the weight of heavier competitive 4-Strokes. Weight comparisons are based on competitors' published weights for 20" (L) models. 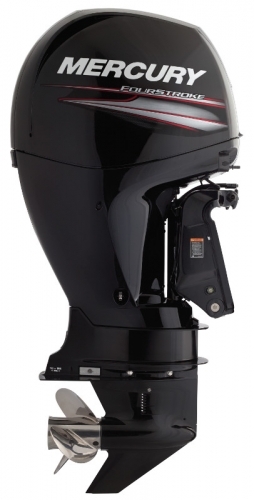 The Mercury 150hp FourStroke incorporates an exclusive and unique Focused Mount System which is 22 percent heavier and tougher than those found on competitive 150hp outboards. The upper mounts are at a much wider 45-degree angle from the engine's center of gravity and in a location where they can operate under ambient temperature conditions, rather than under the higher heat radiating from the immediate powerhead area. Placing the mounts farther away from the powerhead significantly reduces mount temperature and increases mount durability. Angling the mounts significantly reduces vibration transmitted to the boat, at all points in the power band, but especially at transient points from a fast idle to where the boat is coming on plane. Higher durability and significantly reduced vibration mean a more pleasurable boating experience all around. Quiet operation at low speeds makes it easier to converse while in the boat or during a long day of trolling. Saltwater is a marine engine's worst nightmare. Lowest copper content aluminum - Mercury XK360 is the most corrosion-resistant alloy on the market. Exclusive MercFusion paint system features an Electro-Deposition Paint process, which electronically bonds paint to metal throughout the engine, even inside internal water passages. Waterproof electrical systems and connectors sit under a tightly sealed cowling system that uses a baffle to let air enter the cowl but forces water to drain out. Support from the largest network of authorized Mercury dealers. A warranty that's supported by the strength and service expertise of one of the largest dealer networks in the country. What do you get when you combine class-leading displacement with the lightest 150hp fourstroke on the market? Mercury's new definition of performance. 3.0L displacement delivers the powerful torque needed to launch your boat onto plane and provide responsive mid-range acceleration. An exceptional power-to-weight ratio means outstanding fuel economy and more on-water time between fill-ups. A large 4.9" gearcase easily lifts heavy boats better than smaller gearcases found on competitive fourstrokes, significantly improving boat handling from slower cruising speeds to full throttle runs. The Mercury 150hp FourStroke's marine hardened "on-demand" alternator is a 60 Amp (756 Watt) high-output external unit. In fact, this alternator already produces over 2/3 of its charging power at just 1000 RPM... perfect for keeping batteries fully charged while trolling or on that leisurely cruise. Belt-driven means less heat and weight. Provides power only when needed. Fully regulated at 14.2 volts. Hard anodized for best-in-class corrosion protection. MORE TIME ON THE WATER. LESS TIME IN THE SHOP. Under the cowl, the new 150hp FourStroke has a convenient maintenance label highlighting basic maintenance intervals and requirements for the "do-it-yourself's". This label features a QR code that links to a series of step-by-step videos demonstrating just how easy it is to perform routine maintenance such as oil and gear lube changes. QR code linking to videos, local dealers, and a Mercury-direct hotline. No-spill oil change system and easy-access fuel filter. The only fourstroke available with a valve train that requires NO maintenance over the life of the engine. Mercury's new 150 FourStroke has far less transom well interference and a lower profile making it easy to fish over and around, or to mount under tight-fitting engine wells. At a weight approaching that of a 2-Stroke, the new 150 FourStroke is the lightest of its kind, and will easily repower most older hulls not designed to accommodate the weight of competitive 150 4-Strokes. Flexible enough to accommodate mechanical or hydraulic steering, the Big Tiller system, mechanical control/cables, and a full complement of either analog or SmartCraft gauges - this new 150 FourStroke is equally suited to the most basic or the most sophisticated of repower jobs. * Pricing includes Rigging and Prop. Controls, Cables and Taxes extra.